You have probably noticed the small U.S. flags next to gravestones in many cemeteries, including the cemeteries in Barkhamsted. These flags are placed next to the gravestones of military veterans to honor their service to our country during wartime. These flags do not miraculously sprout up each year. In Barkhamsted, the flags are set out each spring by a husband and wife team from Riverton. Photo- Barkhamsted Center Cemetery. Doug and Jan Roberts on their annual spring rounds of the cemeteries in Barkhamsted. They locate the gravestone of each veteran, Doug places the flag and Jan crosses the name off the list. This is the gravestone of Jonathan Johnson who served in the Revolutionary War at the battle of Long Island and in the defense of New York. He was a native of Enfield and like many Barkhamsted veterans of the Revolution, he settled in Barkhamsted after the war. He lived on Center Hill Road near the Hartland town line. He died in 1838 at the age of 76. During the month of May, usually about two weeks before Memorial Day, Doug and Jan Roberts devote a good part of a day to placing flags on the graves of veterans. 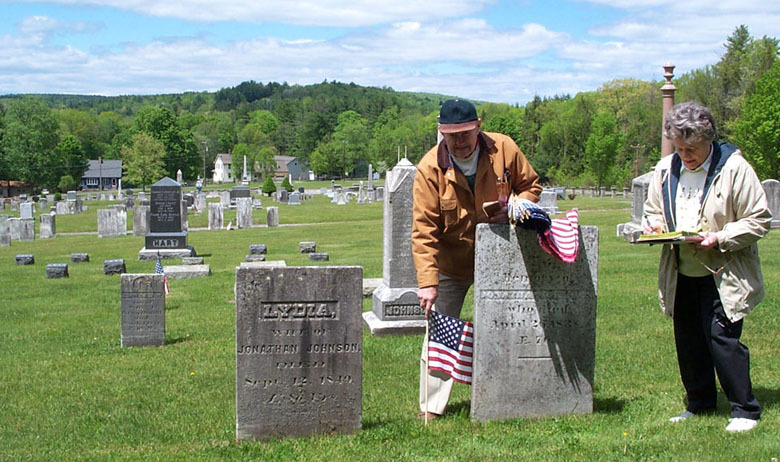 They cover six locations in Barkhamsted where veterans are buried. Three flags are placed at the Lighthouse cemetery on East River Road, 99 at Riverside Cemetery in Pleasant Valley, 96 at Barkhamsted Center Cemetery, 48 at Riverview Cemetery in Riverton, two at a small plot next to the Hitchcock Chair Museum and one at a small family plot on East River Road in Pleasant Valley. Doug points out that the 1955 flood did substantial damage to the Riverview Cemetery in Riverton. Many graves there were washed away during the flood, including 13 graves of veterans. Photo- Riverside Cemetery in Pleasant Valley. 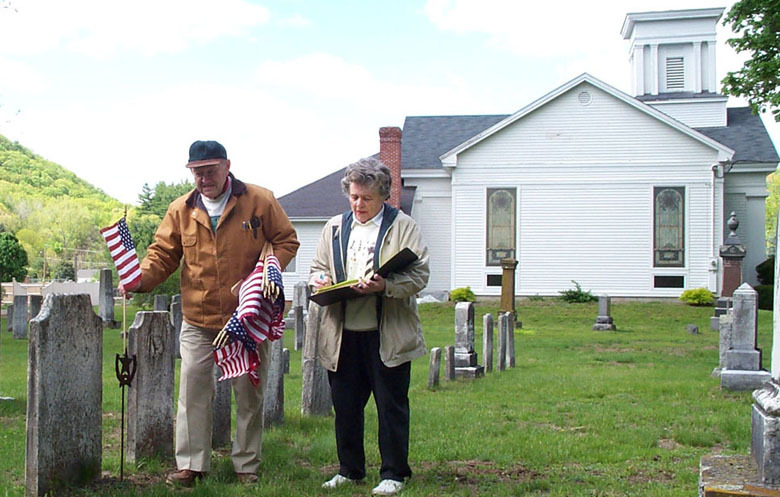 Doug and Jan place a flag at the gravestone of Benjamin Jones, who served in the militia during the Revolutionary War. He served under General Gates in the battle of Saratoga, and later served in a unit that guarded a section of the New England coast. He was a native of Wallingford and moved to Barkhamsted in 1782, living on Ratlum Road. The work involves finding each veteran's gravestone, removing the old flag if it is still there, placing the new flag and checking off the name of the veteran from the list. Finding all the gravestones is not easy since there are currently about 250 veterans buried in Barkhamsted. Also, many of the flags placed a year ago are either gone or have been moved to another spot. Having the list of veterans is an important tool. The list includes the veteran's name and year of death and is organized in the approximate order of the gravestone locations in each cemetery. Armed with the list and years of experience, Doug and Jan easily find most of the gravestones. A few are harder to find, especially the newer ones where the old flag is not still in place. For Doug and Jan placing the flags has become a longtime ritual of spring, one which they have done for over 50 years. Their task serves to honor the memory of the veterans and to help us remember the service of these soldiers in wars stretching over 225 years.